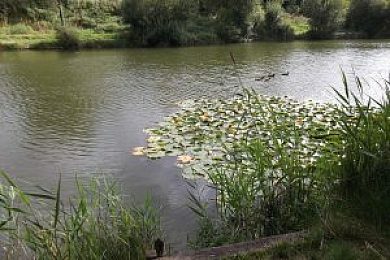 Gunville pond is the oldest fishery owned by the IWFAA and can be found on the West side of Gunville Road in Carisbrooke, close to the Argos industrial estate – situated on the B3323 Gunville Road, Newport. Gunville may be fished on a day ticket but strictly no fishing before first buying a permit or joining the Association. Gunville is a mixed fishery popular with carp specialists, containing as it does fish close to 30lb. There was also a stocking of new 3 – 5lb carp during the 2009 season which are growing on strongly. The lake contains good numbers of bream and tench to over 6lb, plus a good head of rudd and roach to over 2lb. Gunville is also of interest to predator hunters with perch landed to nearly 4lb and holding the club pike and eel records with fish of 20lb 4oz and 4lb 10oz respectively. All new members, except juniors, are required to pay a £5.00 joining fee in addition to the above fees.